Our warm and friendly spirit at the Ephrata Cloister began with the charity and welcoming efforts of the 18th century Sisters, Brothers, and Householder community members. It continues today where their history lives on because of our volunteers. To learn more about volunteering at the Historic Ephrata Cloister contact us at 717-733-6600 or mishowalte@pa.gov. For inquiries into our internship program, please direct correspondence to Michael Showalter. 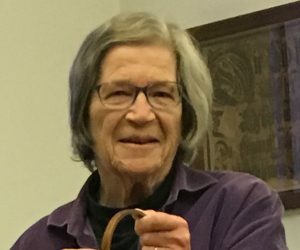 Julia Murphy of Ephrata received the Volunteer of the Year Award for 2019 from the Historic Ephrata Cloister and the Ephrata Cloister Associates. Julia’s work over the past two years exemplifies the best of two roles filled by volunteers at the historic site: one in front of the public, and the second behind the scenes. Julia’s talents at spinning and textile production have made her a favorite part of the school program “Community Days,” where she invites children to discover a once common activity in every home as she turns fibers into thread behind her spinning wheel. When not at work in the museum’s Weaver’s House, Julia has spent countless hours converting the historic site’s 35mm slides and print photographs into a digital resource by scanning the images into the computer. She’s managed to capture nearly 1500 images, only a few at a time, making the scenes part of a computer database for the site. Julia is just one of several volunteers who share their talents and time to preserve the place where Ephrata began. Volunteers play many different roles at the historic site, and new volunteers are always welcome to join the work to keep history alive. Please contact the Historic Ephrata Cloister to lean more about the many important roles volunteers play at the historic site.